Just wondering if anyone has looked at putting the new 2016+ gauge cluster in an older machine? Not sure if it would work or be that easy to do. Personally I like the newer set up rather than the 4 individual gauges that my 2015 Epic has. I did see that you can order the housing and dash cluster from the Oreion parts page. Any thoughts? From what I heard its a plug and play as far as the wiring goes. 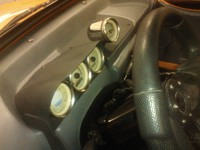 You will need to chop a hole in your dash large enough to pass the wire harness thru and then patch over your old holes. I got housing from Ebay and virtually did the same thing at a much cheaper price. 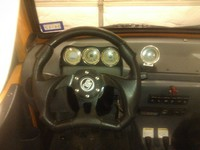 I think I gave $16-17 for the housing and made some slight mods to get it to fit the dash shape and diameter of gauges. It is much better not looking over across the dash ever few seconds to check on things and taking eyes completly off the road to do so. Make sure you look under the dash as to what your drilling thru when making your hole. Did you get this figured out yet. I didn't know he installed and oil cooler either. I know I said check the connection for good contact, but there could be something else going on depending on the cooler he used. Did he leave the stock sending unit in place? So just received my up graded cage cluster from BOR today Any tips from anyone about installing it? When cutting the dash under the cluster for the plugs. Around 3"x1.5". Drill a small hole next to it to use a zip tie to secure wires. He did leave stock oil sensor in place and light would go out if wire was moved had a loose connection. I went ahead and bypassed it with a manual oil pressure gauge that way I know for sure. it's got about 45-50 psi at idle. No more dummy light. Thanks for the help.